Alcohol and Hangover Myths: Fact or Fiction? 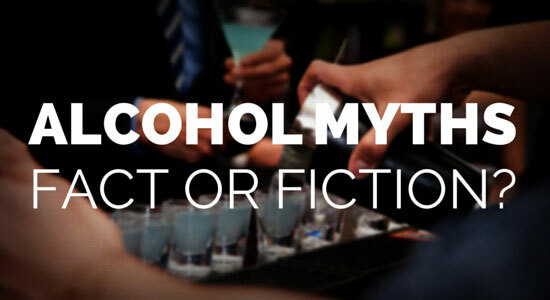 Alcohol Myths: Fact or Fiction? Fiction: You can sober up quickly if you need to. Unfortunately, sobering up isn't easy if you're short on time. Whether it's coffee, an energy drink, a Bloody Mary, a Prairie Oyster, fresh air or a cold shower, nothing will speed up the sobering process. The combination of alcohol with stimulants like coffee and energy drinks can really confuse the body, rather than balancing it out. Caffeine can create a very alert and awake intoxicated person and could give them a false sense of confidence that they're no longer drunk. The Bloody Mary, an example of "the hair of the dog that bit you" idea, has also been an alleged hangover remedy for decades. Still, the truth is if someone drinks more alcohol after their body has already processed so much of it, they're probably delaying the inevitable nausea and headache. A Prairie Oyster isn't much help either. It's a supposed headache cure composed of one raw egg mixed with a dash of hot sauce, vinegar, Worcestershire sauce, salt and pepper, all swallowed in one gulp. According to headache experts, this remedy does nothing positive for the body. Rather, it has the potential to make the drinker sick from ingesting raw eggs. Fresh air and cold showers are a friend to whisking away sleepiness, but they're not so helpful to an intoxicated person. They can contribute to reducing body temperature even more than the alcohol already did and cause shock to set in. Know your limits and don't exceed them. The best, and only, solution to sobering up is time. Also, never drink alcohol on an empty stomach and always drink water between alcoholic drinks to stay hydrated. Instead of a regular Bloody Mary, check out our Virgin Garden-Fresh Bloody Mary, or some of our other delicious mocktails. Fiction: You can beat the breathalyzer test. Keep your pennies and breath mints in your pocket. Mythbusters took a crack at this myth and proved that seven of the alleged breathalyzer passing techniques don't work, which included the standard copper coins under the tongue, eating an onion, hyperventilating, and using mouthwash or breath mints. Others involved placing a battery under the tongue and applying denture cream before the test. All of these methods had no effect on blood alcohol content (BAC) levels, except two that resulted in BAC increases. Gargling with mouthwash and hyperventilating were shown to inflate a person's BAC level. Also, refusing to take the breathalyzer test may not serve you well. In Pennsylvania, if drivers are charged and convicted after refusing the test, they are prosecuted as if they were driving with the highest BAC. Therefore, the driver is automatically subjected to longer license suspensions and higher fines. Don't reach for the pennies or batteries and, most importantly, don't get behind the wheel. We've seen firsthand the damage that can result from drunk driving, so don't be part of the statistic that puts people at risk 112 million times per year. Fiction: "Beer before liquor, never sicker. Liquor before beer, in the clear." While it stands to reason that mixing different types of alcohol in excess will definitely lead to a sicker morning, Mythbusters "busted" this myth by pointing out that alcohol content is more important than the type of alcohol you drink. A 1.5 oz. standard serving of liquor packs a more powerful punch in less liquid than a serving of beer at 12 oz. This can lead some people to assume they're safer with beer. However, if the drinker consumes the same amount of alcohol content in beer as they would with a combination of beer and liquor, the odds are in the person's favor that they won't feel so great later if they drink excessively. Mythbusters offers a great new mantra, "No water plus booze, and tomorrow you'll lose," but our law firm also prefers, "Too much liquor makes you sick and too much beer does the same trick. Add in some water, subtract the car keys, and tomorrow you can do as you please." Fiction: Passing out from drinking alcohol isn't that big of a deal. Wrong. Passing out and falling asleep are two very different things. Passing out after drinking alcohol means that the body can't handle the amount of alcohol it was exposed to, so it shuts off most cognitive functions and slows down the heart, blood pressure, and breathing rates. If those rates get too low, the victim can stop breathing and vomit without waking up, which are the symptoms of an alcohol overdose, also known as alcohol poisoning. The total lack of awareness could also cause the drinker to become a victim of assault. Don't drink past your limit. If you are taking care of anyone who has had too much to drink, don't leave them alone and definitely don't let them get behind the wheel. Lay the person down on their side and monitor their awareness and breathing. If they are not waking up or their breathing is irregular, call 911 immediately. Fiction: Drinking keeps you warm. A snifter of brandy out in the cold won't keep your body as warm as you feel. Alcohol's chemical composition causes blood vessels to open and send more blood to the surface of the skin, making the skin appear redder and flushed. This change causes the nerve endings to respond to the blood flow, which then makes people feel warmer. However, because the blood is drawn towards the body's surface, it can easily be suctioned out by the cold air. This actually decreases body temperature. So, thanks to that snifter of brandy, the drinker becomes physically colder and less aware of the body's actual temperature. Instead of drinking alcohol when you're out in the elements, consider pouring a cup of our Warm Pumpkin Spice Au Lait or hot Ginger Cranberry Tea. Heated, non-alcoholic drinks may keep you a little warmer and fresh ginger can increase the activity of your circulatory system. “Myth Busted: Sucking on a Copper Penny Will Fool a Breathalyzer Test.” About: Urban Legends. March 9, 2010. “Can You Trick a Breathalyzer?” BACtrack. April 2014. “Everything You Know About Getting Warm is Wrong.” Huffington Post. Nov. 25, 2013. “Beer in the Clear, Liquor Never Been Sicker.” Discovery Channel. 2013. “Hangover ‘Cures’: What Helps and What Hurts.” ABC News. Jan. 1, 2010.